Many think that the term industry and sector resemble each other, as both are used to indicate enterprises that either operates in a particular segment or their business type are identical. However, the two terms actually indicate two different divisions of the economy. While the industry is an umbrella term, that covers all the firms which are engaged in similar business activities. On the other hand, sector refers to the broad classification of the economy, into various segments. In an industry, there are many companies offering similar or substitute products. As against, there can be many industries in one sector. The article presented to you talks about the difference between industry and sector in a detailed way, Have a look. Meaning Industry refers to the cluster of firms involved in the production or processing of similar products. Sector is used to mean the segment of economy, into which different business segments are classified. The term industry is used to define the group of firms engaged in the production of similar or related goods. It is a grouping of several manufacturing enterprises of an economy on the basis of the business activities they are involved in. The name of the industry relies on the product, in which the firm deals. The industry also refers to the economic activities, which are related to the conversion of raw materials into finished goods. Most often, the term industry is used to indicate those activities, wherein the application of mechanical tools or appliances and technical skills takes place. It encompasses activities such as production or processing of goods, breeding or raising of animals. Primary Sector: The primary sector covers activities relating to extraction and production of natural resources. It includes agriculture, animal husbandry, forestry, etc. Secondary Sector: In this sector, the processing and conversion of materials into final goods takes place. It includes all kind of manufacturing and construction activities. Tertiary Sector: Tertiary as the name suggest, the sector includes all the support services such as banking, transportation, warehousing, packaging, communication, advertising, that are required for the effective functioning of the primary and secondary sector. Quaternary Sector: A sector, that is reserved for all intellectual activities, such as education, research and so on. The cluster of firms involved in the production or processing of similar products is known as an industry. The segment of the economy, into which different business segments are classified, is called as a sector. The classification of industries is done on the basis of a process performed by them. On the flip side, sector divides the economy into various segments on the basis of business activities undertaken by the firms. 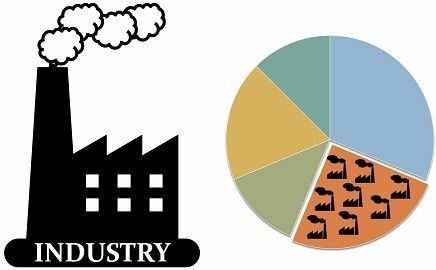 The scope of the industry is narrower than that of a sector because there can be thousands of industries in an economy, whereas there can only be a handful of sectors. Further, a particular sector of the economy, consist of hundreds of industries. The term industry is used to define firms operating in a particular or specific segment. As against this, the term sector is a comprehensive term, which includes all the industries, working in a specific segment. While the industry is a group of firms, the sector is a group of industries. So, at the end of the discussion, it can be said that industry is a subset of the sector. Investors and economists, study industries and sectors with a view to understanding better, which sector or industry contributes to the growth of the economy and which one of them is highly profitable. Further, a comparison can also be made between the companies operating in a particular industry, to identify which company will provide expected returns to the investors.